Is it necessary to sign a FSBO commission agreement before a broker shows your home? Do I need to sign a new agreement every time? 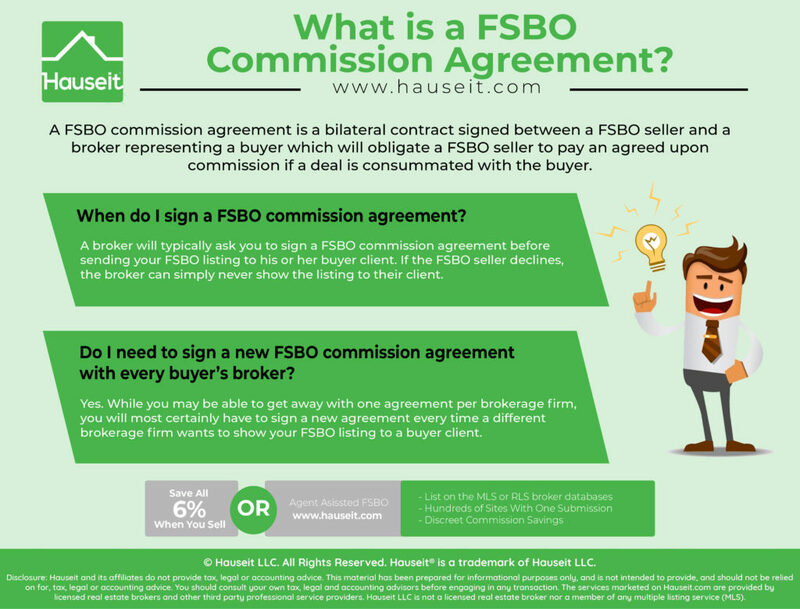 A FSBO commission agreement is a bilateral contract signed between a FSBO seller and a broker representing a buyer which will obligate a FSBO seller to pay an agreed upon commission if a deal is consummated with the buyer. The first instinct For Sale By Owner sellers have is to demand brokers to collect their own commission from their buyer. This response puts a buyer’s broker in a very awkward situation and is the reason why buyers’ brokers do not show For Sale By Owner listings in the first place! If a buyer chooses to have a broker, why don’t they pay for their advice themselves? This mentality is precisely the reason why For Sale By Owner listings are considered “off market.” If a buyer client is worth 3% commission to a buyer’s agent, why on earth would the agent risk that pay day by sending the buyer a FSBO listing? If the buyer actually liked and wanted to see the FSBO listing, how on earth would the agent proceed? How would the buyer agent ensure that he gets paid by the seller? What’s preventing the buyer from searching for the address online, realizing it’s a FSBO sale and contacting the seller directly? The easiest answer to all of these questions is to simply never show the For Sale By Owner listing in the first place. And that’s exactly what happens in reality. Buyers’ agents search their local co-brokerage listings database for property ideas to send to their clients. According to a Hauseit study of total listings in the NYC metro area on popular real estate search websites, anywhere between 96-98% of listings in the city are traditional, for sale by agent listings. That means buyers’ agents can instead show their clients almost any other available property without ever having to worry about being paid. Commissions are clearly listed in their local inter-brokerage shared listings database and the co-broke is contractual among member firms. There is never a need to sign a FSBO commission agreement as every member firm has already contractually agreed to co-broke on all of their listings! When should I sign a FSBO commission agreement? A broker will typically ask you to sign a FSBO commission agreement before sending your FSBO listing to his or her buyer client. This is the smartest situation for a broker to be in as he or she still retains control of the situation. If the FSBO seller declines, the broker can simply never show the listing to their client. Sometimes a broker will ask the FSBO seller to sign it after the broker’s client has already seen it but before the showing takes place. In this situation, the broker is playing catch-up and just wants to ensure that he or she can get paid. If the seller declines to sign an agreement the broker is in a real conundrum at this stage. The broker can lie to his client and cancel the showing, or the broker can proceed with the showing with zero protections in place on how or if he or she gets paid. Because it’s so easy to get into this dilemma, brokers representing buyers seldom show FSBO listings. Why risk a buy side commission and deal with the stress of coaxing a FSBO seller to actually pay you? Do I need to sign a new FSBO commission agreement with every buyer’s broker? Yes. While you may be able to get away with one agreement per brokerage firm, you will most certainly have to sign a new agreement every time a different brokerage firm wants to show your FSBO listing to a buyer client. 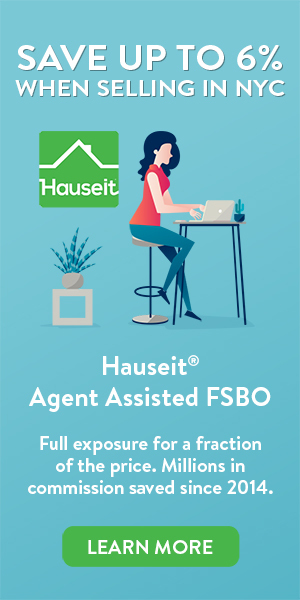 Because it is so difficult for FSBO sellers in NYC to engage buyers’ agents, many home owners are instead selling their homes via “agent assisted” FSBO sales. In an agent assisted FSBO, a home seller pays a flat fee to be listed in their local MLS (RLS for NYC customers) inter-brokerage shared listings database. The local MLS will then syndicate the listing out to many popular real estate search websites at the same time. Hauseit has improved on this time tested model by pairing home sellers discreetly with highly rated, traditional NYC brokerage firms instead of “no name” discount brokers. Hauseit customers truly receive the “full exposure” you’d expect from paying 6% commission.